I planted a garden over the weekend. I enlisted the moral and logistical support of my sis/Birth Love Family creatress, Shaina, who is experienced and confident with plants. 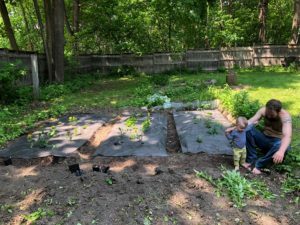 After watching her put in the first bed of herbs and tomatoes, and listening to her tips and instructions, I spent Monday in the dirt preparing the beds and putting the rest of the starters (kale, arugula, squash, lettuce, etc) into the earth. It felt amazing! Theo and Chris were out there with me too for part of the time just hanging out on a beautiful day. It was rewarding, physically engaging, fun and grounding. I wondered why it took me so long to open up to having a real garden as being a possibility for me, and realized that it was mostly just my lack of confidence and a feeling that I wouldn’t be able to do it “right”. The only plant I’ve ever been able to keep alive is some kind of indestructible, apocalypse-proof thing I got from IKEA in Philadelphia years ago that somehow withstood the move to Vermont and almost heartbreakingly infrequent watering over the last three years. It doesn’t make sense, really. I’ve always considered myself to be loving, nurturing, and giving, but somehow these qualities have never translated to caring for the lives of plants. I had an ill-fated little patch of garden at our house out in Williston when I first moved to Vermont, randomly planting some kale and arugula in rocky soil with little sunlight, no compost, and no faith. But somehow, in spite of everything I didn’t know and didn’t do exactly right, that kale and arugula grew abundantly all summer. Yet, in spite of this evidence in my ability to grow things, I still have held onto a strong story about myself that I’m not a gardener, don’t have a green thumb, don’t know what I’m doing, etc. Just as I was never totally convinced I was cut out to be a mother. And still often feel that I don’t know what I’m doing in my day-to-day experience as a mama. But I do it in spite of this feeling, and this feeling actually makes me more humble, open, observant and aware. And over time, I learn and figure out the way. Theo is a strong testament to my ability to keep a living being alive and thriving. And as I know from my little patch of dirt in Williston, that gave me what I needed for salads and pesto all summer, they grow and thrive despite the stories we have about ourselves.